Rev. Timmons asking Trump to stop making a political speech in her church. Photo via AP. 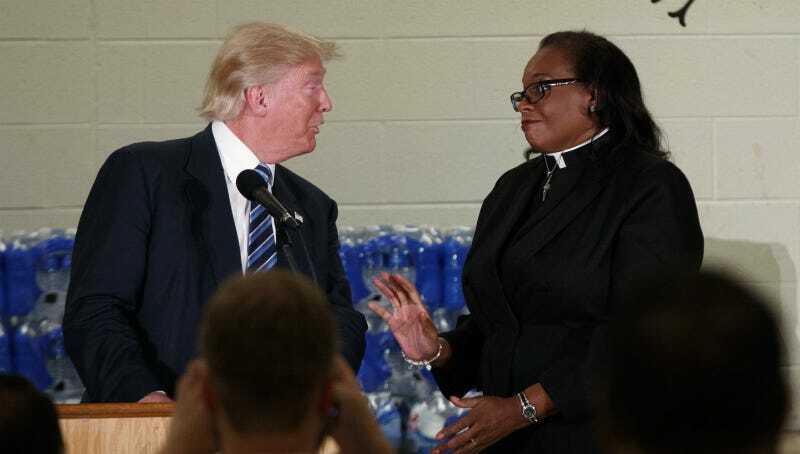 Donald Trump, a dry creek bed mysteriously studded with dog turds, visited Flint, Michigan on Wednesday, stopping by a local church where he was supposed to express some kind of sympathy for the city’s ongoing, disastrous water crisis. Instead, he complained about Hillary Clinton until the pastor asked him to cut it out. If you supposed that Donald Trump would not stoop to attacking a pastor, I would like some of whatever you’ve been taking to sleep through this election. Trump ultimately spoke at Bethel for just over five minutes.